The first thing that springs to mind whenever I hear the brand Aston Martin is James Bond. For more than five decades, the Aston Martin DB series have been featured in many James Bond films. Everything from the sound of powerful engine noise revving up to the classic car chasing scenes (with Daniel Craig behind the wheel of course) all resembles the Aston Martin DB heritage ingrained in Bond movies. I am an avid James Bond fan (well, since Daniel Craig took the helm of Bond in Casino Royale), so when I was informed that I would be test driving the new DB11 model, I could not contain my excitement. The new DB11 is the latest model of the DB series which was only revealed at the Geneva Motor Show in 2016. DB11’s predecessor, the DB9, was launched 13 years ago. Eager and anxious to try out the new DB11, I arrived at the Aston Martin Happy Valley showroom at my scheduled time slot and quickly spotted the car being parked on the side of the road. I could not take my eyes off of it, as I was mesmerised by its gorgeous silhouette. From the front, the DB11’s hood/bonnet features the largest single piece of aluminium on any car in production which is perfectly curved like a clam-shell and cut into four air vents that assist in cooling its engine. As I followed the lines of the DB11’s body from the front to its back, I noticed that the back is far wider than its front. One of the key features of the DB11 body’s lines is that they are designed so that air will be sent underneath the bodywork, forcing wind out on the rear part of the car like a virtual spoiler of air. Aston Martin even named this as the “Aeroblade™”. As I climbed into the driver’s seat, the first thing I noticed was the high-tech dashboard. The large digital dials present clear and unfussy information. The cabin is beautifully trimmed with sumptuous rich leather from head to toe and details such as perforated brogues can be found on the armrest, seats and doors. On the left side of the steering wheel is the central control panel fitted with numerous buttons and an 8-inch infotainment screen. Here, Mercedes-Benz owners will find a familiar set of controls as the Mercedes’ “Command”-based system has been incorporated into the DB11. Fung Chu, Aston Martin’s sales representative, confirmed that Daimler AG has a five percent stake in Aston Martin which explains such influence and also its use of the Mercedes-derived engine in the DB11. The gears are also conveniently located in this centre stack and are presented in the form of buttons: “Park”, “Reverse”, “Neutral” and “Drive”. My route for the test drive was from Happy Valley to Shek O Big Wave Beach and from Big Wave Beach to North Point. After I started the engine, I noticed that the brakes were much heavier than my own car. It took me a while to adjust to their feel. Next, I stepped onto the gas pedal and the nice engine sound came roaring without hesitation. Indeed, it’s such a nice sound to the ears. Although the DB11’s body is without a doubt long and heavy, I was surprised with how compact it feels when driving it. Carrying three passengers, the weight did not affect its performance one bit. DB11 offers three modes: “GT”, “Sport” and “Sport +”. I started off with the “GT” mode. As we approached the highway on the Island Eastern Corridor, I switched to “Sport” mode and noticed the difference right away. The suspension setting can also be adjusted into the same three modes. Once I adjusted the suspension and driving mode to “Sport +”, its engine noise was much more noticeable as compared with the “GT” mode. However, while I was switching in between the different modes, I noticed that my fingers on the buttons were faster than the indicator on the dashboard. It required some time to adapt to this and I had to switch between the different modes several times in order to get to my desired one. With 600 horsepower and a 5.2 litre twin turbo V12 engine, there was no issue on the pick-up of the car either on the slopes or on tight bends. The car corners keenly and flat on the winding roads to Big Wave Beach. The steering on the DB11 is equipped with its first electromechanical technology and feels a little lighter than expected for a European car but that did not bother me that much. It was simply a pleasure cruising around in the DB11. As we were approaching the parking area of Big Wave Beach, an oncoming car was heading straight towards me and I was able to test out the car’s responsiveness and exerted full force on the brakes. This resulted in the car’s swift and automated shift-gear response which also ensures that the RPM would not be dropped significantly in such a short moment. This, along with the handling of the car, was truly impressive. Although it was definitely an eye-opening experience to cruise around in the DB11, I did not have much of a chance to accelerate in it with the traffic cluttering the route to Big Wave Beach. It would have been even better if I could take the DB11 on a longer highway with less traffic to test out its speed in the “sports” mode. 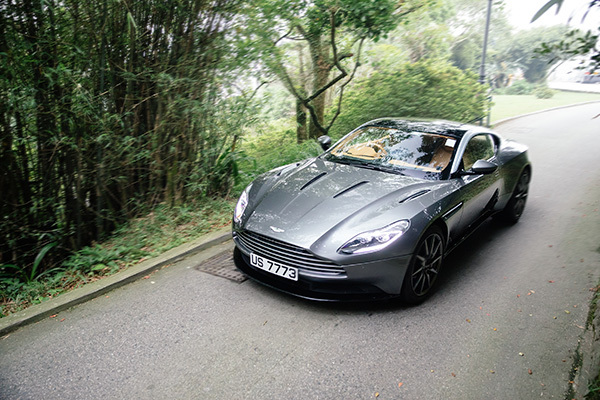 The price tag of the DB11 comes to a hefty HK$3.8 million. If you have the money to spare and are looking for a unique option amongst similar GT sports car, the Aston Martin’s DB11 will not disappoint you. It has all the luxurious details, comfort and performance you would ask for in a dream car. The driving experience will definitely leave you in awe and you will likely never want to leave the driver’s seat.